A fun and colorful way to study the Bible and stay focused! My colored pencil set has 2 colors on each pencil. 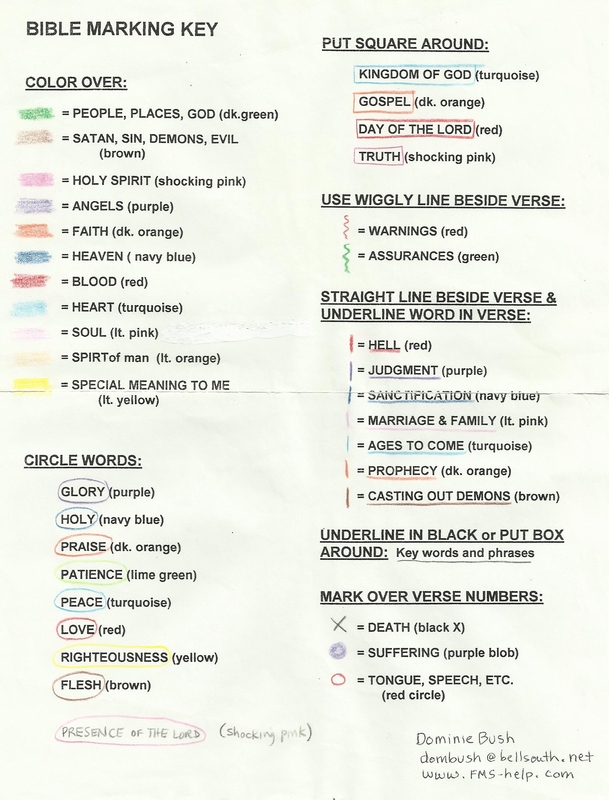 1) I take just a few verses at a time (low level of comprehension....ha) and using the Bible Coloring Chart (below). I look for a few themes to see if there are any words I can color in. I usually start with DARK GREEN just to catch the nouns (people, places, God) and get my mind focused on what I'm reading. 2) Then I look over the chart a little more to see if there are any words that can be circled or underlined in a particular color. 4) The last thing I do is mark in YELLOW any verses that I want to remember, need to act on, etc. These are the verses I read when I'm in a hurry and just need some quick inspiration/direction for the day. The greatest thing for me is that when the page is finished, just by looking at the colors, I know right away what topics are in that chapter. In the example above, you see a lot of BROWN. This means there are things to avoid (sin, evil, wrong) - in this case it is about our speech - boasting, backbiting (slander), unedifying words, etc. In other passages, you will see different colors. For example, Hebrews 11 will have a lot of ORANGE (the FAITH chapter). 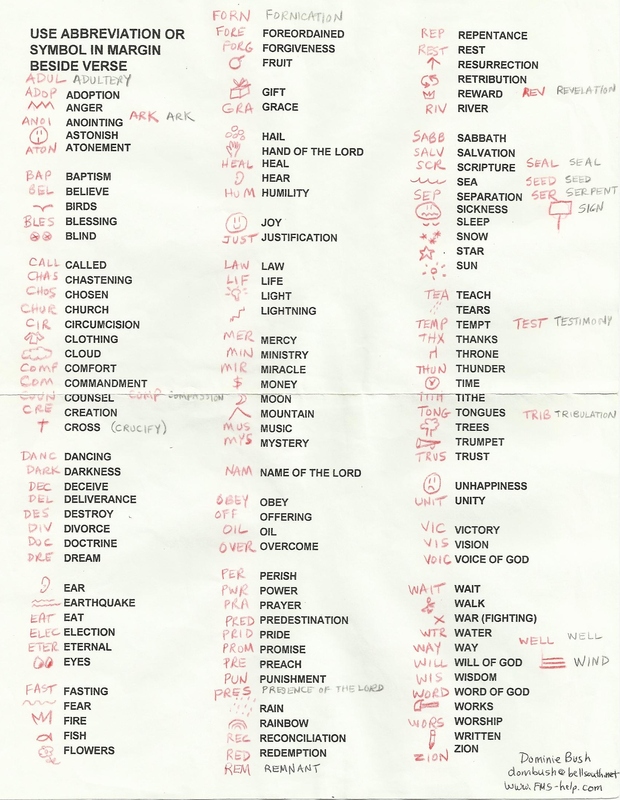 I Corinthians 13 will have a lot of words circled in RED (the LOVE chapter). The book of Daniel where the angel Gabriel speaks with him will have a lot of PURPLE - and so will the chapters surrounding Jesus' birth in the New Testament gospels, because angels had a lot to do with that time of history. Well, this isn't a perfect method, but it's fun. You may find things you want to change or omit. You can adapt it to your own particular needs or study interests. It's amazing that even when I am "fogged" or tired, I can still keep my mind focused on what I'm reading, because coloring in the themes is so much fun!!! I am much more faithful with Bible study when I do this! I have a separate Bible at home that I do my coloring in, and I take a different Bible to church. The one I take to church I use for writing down inspirational things I hear from the pulpit. One day when I am very old and in a nursing home (if I live that long, have my wits about me, and can still read and comprehend), these two Bibles will be my greatest treasures. They are SPIRITUAL GOLD MINES!!! 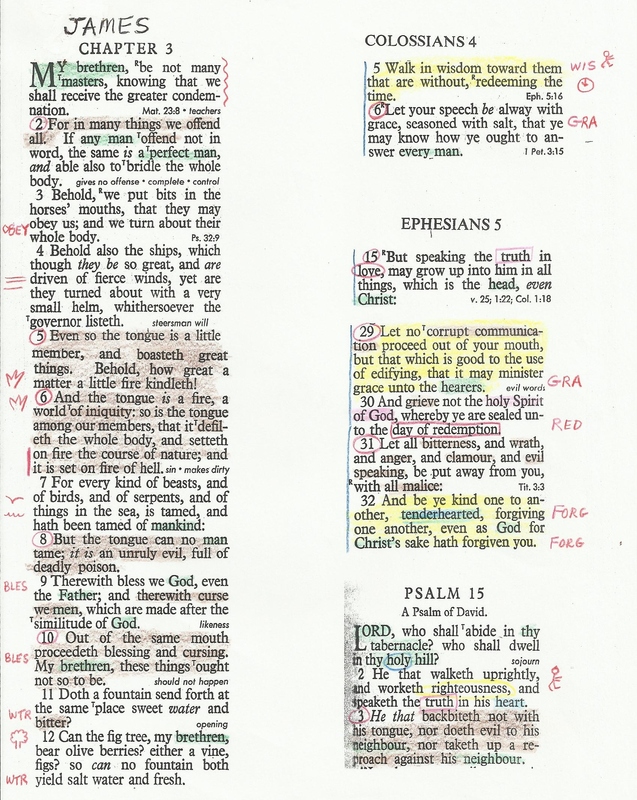 I hope you enjoy the coloring method to absorb more of God's Word! 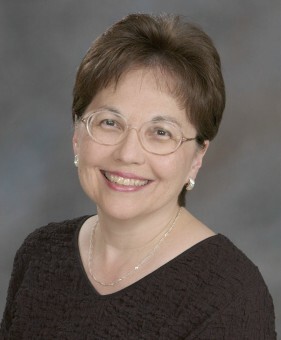 You can right-click on any chart above, select "Save Image As," then print it out (in color). Or write dombush@bellsouth.net if you want the charts emailed to you.